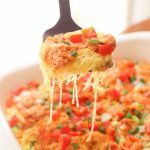 Skinny Buffalo Chicken Spaghetti Squash Bake - Low Carb & Gluten-Free! 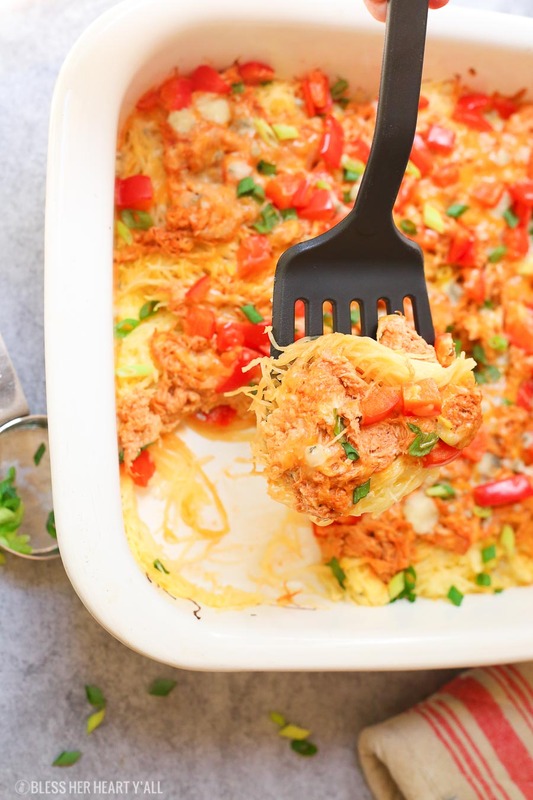 Skinny buffalo chicken spaghetti squash bake combines creamy flavor-packed buffalo chicken with fresh veggies and blue cheese crumbles all on a bed of spaghetti squash! 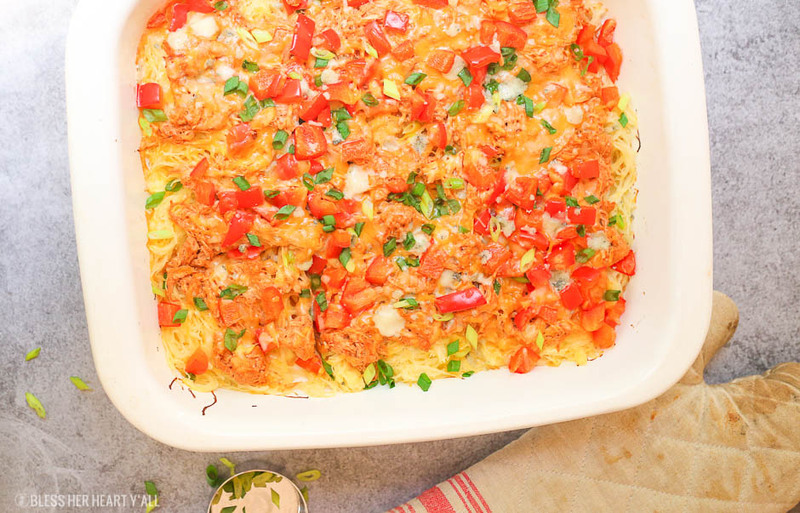 This buffalo chicken spaghetti squash bake is a simple combination of gluten-free and low carb ingredients to create one warm, creamy, buffalo-flavor packed dish. The homemade creamy buffalo sauce that coats the shredded chicken is a quick mix of hot sauce, greek yogurt, garlic powder, paprika, and salt and pepper. 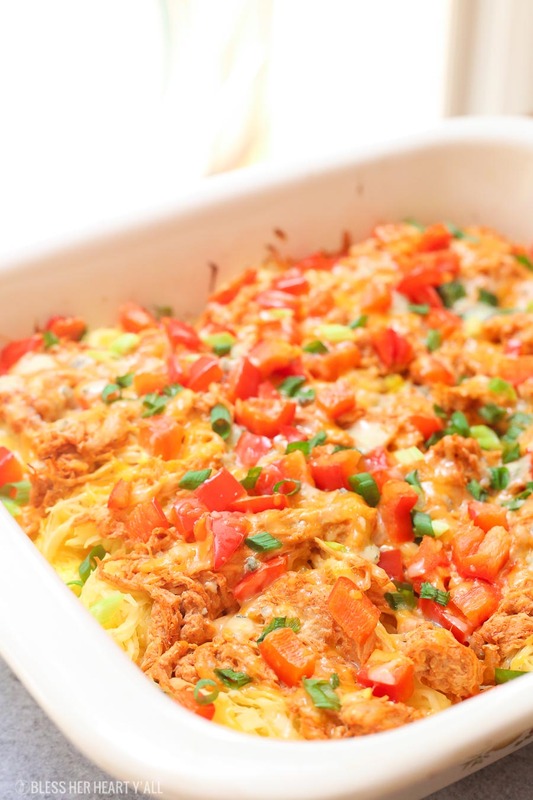 The bed of spaghetti squash that is the base of this skinny casserole is roasted in the oven for 40 minutes, scraped to create the spaghetti squash “noodles”, and then topped with all the skinny buffalo chicken goodness before it is baked for another quick 10 minutes. The shredded cheese and the blue cheese crumbles are completely optional and you can choose to put on any veggies that you’d like. My favorite vegetables to toss in the dish are bell pepper slices and green onion slices. 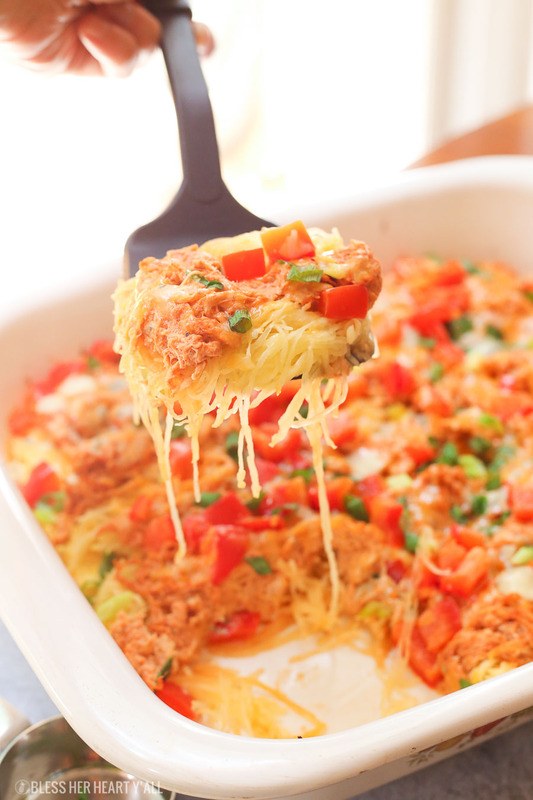 This buffalo chicken spaghetti squash bake uses only 1/3 cup of the shredded cheese and just a handful of the blue cheese crumbles and the rest of the creamy flavor comes from the greek yogurt. But this dish is awesome without the cheese melted on top too. Preheat your oven to 400*F. Cut your spaghetti squash in two lengthwise and place on a four-sided baking sheet. Using a spoon, scrape out the seeds from the center of each squash half. Spread the olive oil and salt on the inside flesh of each squash half and roast for 40 minutes. Remove from oven and allow to cool until you can safely handle the squash without burning yourself. Using a fork, scrape the flesh out of both squash halves to produce spaghetti squash noodles. Place these squash noodles in the bottom of a 9 x 13 baking dish. In a small mixing bowl combine all the buffalo sauce ingredients together and mix it in with the chicken. 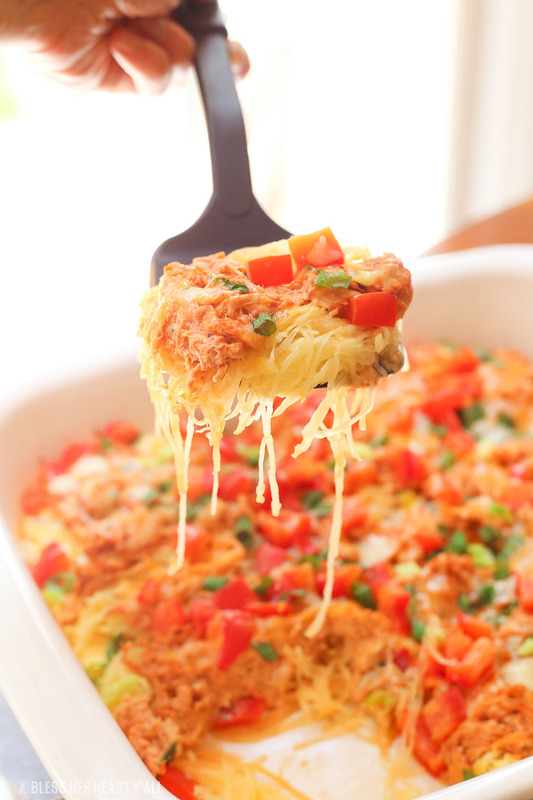 Place the buffalo chicken on top of the spaghetti squash layer in the baking dish. Add the vegetables and cheese as the top layer and bake in the oven for another 10 minutes. Remove from the oven and allow to cool a few minutes before serving. Enjoy!